1.5 lbs baby bella mushrooms ( or white) cleaned, stemmed, and scooped out. Pre-heat oven to 350. Line a baking sheet with parchment. 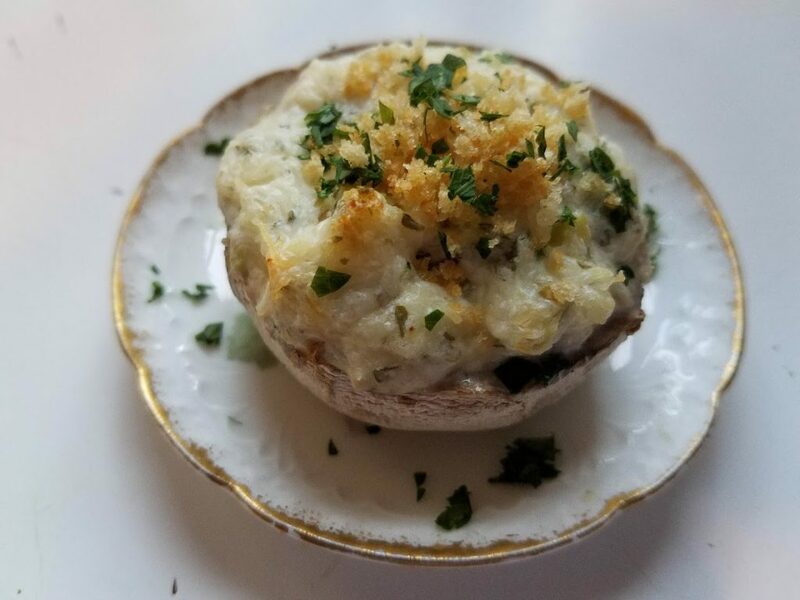 Arrange mushroom in a single layer and bake for 15 min to release liquid. Remove and let sit on paper towel. In large bowl combine softened cream cheese and mayo. Add remaining ingredients except the crab. When combined, add the crab. Fill each mushroom cap with filling making sure not to over stuff. bake for 15-20 min until the filling is hot and lightly browned. Garnish with chopped parsley. I also toasted some Panko bread crumbs in a skillet with butter to lightly brown them. This happens quickly so be careful. Sprinke some of the crumbs on top along with the parsley. If you want to do this ahead, make the filling minus the crab and add that when you are ready to bake these. The mushrooms can be prepared (but not baked) at least a day in advance and wrapped up in the fridge. Assemble when ready! Oh my, you’ve done it again. That looks amazing! Great recipe jenn! Looks amazing and easy! But this is not at all the point…. What your faithful followers REALLY want is for YOU to make them, we come over, and WE enjoy them. Along with your great company of course. Let us know the time and date, and we will be there! P.S. we will probably be thirsty….sooooo……. OMG Cher! What a funny and great comment!! LOL 🙂 Yeah, I suppose you’re right, I should just have you all come over……What on earth was I thinking?????? Oh nummy, have to share this with Wilson!